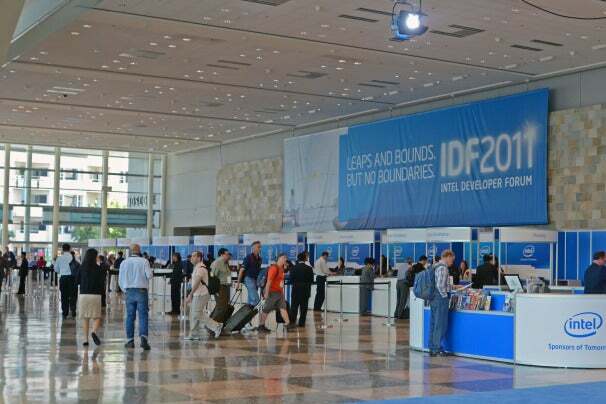 The Intel Developer Forum concludes today. Read on for news on Intel's new mobile plans, future integrated GPU designs, and more. Intel is well aware that the world is moving more and more to mobile device use. The company has been shifting resources toward building more effective mobile CPUs. The Atom processor is Intel’s weapon in the battle against embedded solutions like ARM. To date, Atom’s been more of a low end laptop or tablet processor and not well suited to mobile phones. That’s one reason Intel is publicly committed to shipping Atom using 14nm process technology by 2014. That manufacturing technology should yield die sizes and power envelopes suitable for ultra-mobile devices like smartphones. However, Intel isn’t waiting that long. Intel has been prepping Medfield, a single chip follow-up to Moorestown. Moorestown was aimed at the high end smartphone market, but was poorly received by handset makers. Medfield fixes many of the issues inherent in Moorestown with the upcoming Medfield, which is a single chip solution capable of running up to 1.9GHz. Intel claims battery life that should be competitive with existing smartphone solutions. All that puts Intel’s Android partnership in context. Paul Otellini demonstrated a Medfield smartphone prototype during his IDF keynote, and Intel had Medfield tablet prototypes on display. 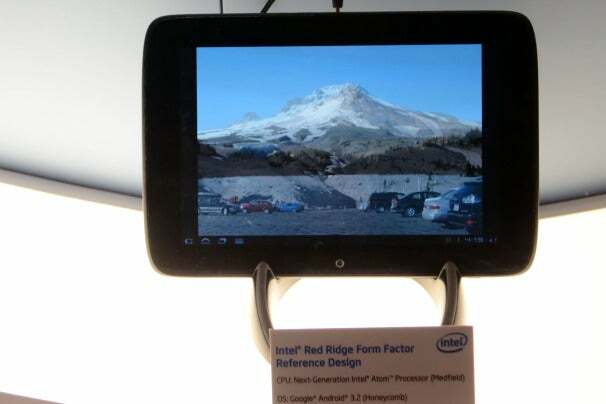 Intel showed Medfield-based tablet prototypes behind glass. We also spoke to one source off the record who noted that battery life of devices under development was up to a full day under normal use. Medfield based smartphones running some flavor of Android – likely Gingerbread – will likely ship early in 2012. Of course, the competition isn’t sitting still. It’s well known that Apple is readying a follow-up to the iPhone 4, and Nvidia’s garnered some design wins for its Tegra platform. Qualcomm and TI are also busy with their designs. All of those are ARM based, and x86 will have a steep upward path, though with Google’s help, maybe Medfield-based phones will see the light of day in 2012. David Blythe was one of the key architects at Microsoft during the development of DirectX 10 and 11. He’s now at Intel, helping them work on improving the software required to make Intel HD Graphics run better. In his discussion of the history of graphics software stacks, Blythe covered developments from the Silicon Graphics era, which consisted of completely proprietary, immediate mode designs, to the present era of programmable GPUs that are connected to the PC via external connects, like PCI Express. The current DirectX 11 is still tuned to the generation of high power consumption discrete graphics cards with their own onboard memory (frame buffer). OpenGL is pretty much in the same board, still more tuned to high performance GPUs with their own memory. Blythe sees a need for these APIs to evolve to take advantage of on-CPU graphics, which are increasing in capability and performance, but require other constraints. Integrated GPUs have power management constraints, security issues, for example. In addition, processor graphics, as Blythe calls integrated GPUs, are different animals entirely from discrete GPUs. They share memory with the CPUs, which has pluses and minuses. Sharing memory with the CPU makes CPU-to-GPU transfers potentially more efficient, but PC memory still lacks the massive memory bandwidth of high end graphics cards. In addition, the current APIs generate overhead that’s really not needed when feeding data to the integrated GPU. Processor graphics don’t require the overhead of buses or interconnects to cross, and can be built ot use the same process address space as the CPU. An API tuned for processor graphics might use operating system functions for allocating memory, rather than the more complex and esoteric memory management needed when communicating with a GPU that uses its own private pool of memory. Blythe noted that what he’s suggesting doesn’t mean that the high level API programmers are familiar with needs to change, though their techniques might. But the underlying abstraction layers that talk to the hardware need to be aware of the different behaviors of processor graphics in order to exploit their unique strengths. Intel, like the rest of the industry, is going through a sea change. This year’s IDF was an odd mix. Paul Otellini’s keynote sounded almost identical to the keynotes of past years in the beginning, with the brief announcement of the Google relationship being the one nod towards the changes that have been sweeping the industry. Products like Sandy Bridge Extreme and the X79 chipset are also nods to Intels storied history of being the premiere manufacturer of desktop CPUs. Ultrabooks and Medfield, however, are clear demonstrations of Intel’s future directions. Though the first Ultrabooks are based on the existing Sandy Bridge mobile CPUs, they’re really ideal platforms for the next generation Ivy Bridge platforms. Ivy Bridge, with its beefier graphics and improved power usage, will make Ultrabooks viable for a wider audience than users who simply crave an ultramobile PC for light office chores. Medfield will see Intel plunging into the mobile phone waters in earnest, and the initial reception will likely be chilly. But Intel needs to put a stake in the ground if it plans on really taking the mobile industry by storm with 14nm products. The future is mobile, and Intel is well aware of that. But Intel has shown with the initial Core 2 processors that it can make massive corporate shifts quickly--now we just need to wait and see if they can do it again.